In this six figure Black Panther themed wave there is an even split between comic and movie figures, with the build-a-figure tipping the scales in favor of the movie characters. While I do wish we could have maybe fleshed out the Black Panther cast a bit more, I’m not disappointed in any of the comic selections in this wave. They are all characters in need of a good redo. 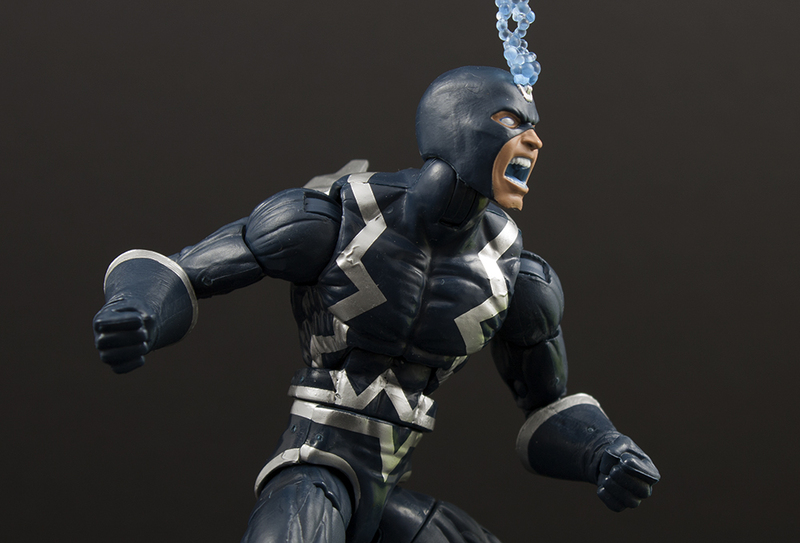 We’ve gotten a few Black Bolt action figures in Marvel Legends previously, all of them from Hasbro. The first was part of the 2009 Walmart exclusive Nemesis build-a-figure wave. This one had cloth under-arm wings and used a body that just wasn’t acceptable for Marvel Legends, even for the time. The formula was greatly improved when he saw release as part of the 2014 Thanos Imperative San Diego Comic Convention exclusive box set. This one used the tried and true Bucky Cap body with hard plastic wings. Okoye series’ Black Bolt is essentially a repainted Thanos Imperative version that includes two new heads. I’m actually a bigger fan of the blue color scheme that this Black Bolt figure sports. Sure, black is more classic, but we got that figure already. At first I thought that his neutral head was just reused from the first release, but surprisingly it wasn’t! Both heads in this set are new. These new heads make all the difference in the world. The only catch is that if you prefer black, then you won’t be able to swap the m onto the Thanos Imperative figure without a little color matching and painting. Now onto the wings. I’m still not sure we’ve figured out that whole thing yet. While the plastic ones are an improvement over the easily frayed cloth of the original release, they still have their limitations. They are only connected to the side of his torso when the arms are straight out at his side. Otherwise they just kind of jut out of his triceps behind his back if he’s doing anything else. Of course, this is fine if you only plan to have him screaming on your shelf until the end of time, but this is a Marvel Legend and he should be posed! Would I recommend Hasbro Marvel Legends Okoye Series Black Bolt? Yes, he’s great! And to the more casual collector, this is the first version of the character that isn’t part of an exclusive wave or box set. The base figure was already fantastic, and that new screaming head just knocks it out of the park. I highly recommend Black Bolt. Walgreens also released a Medusa earlier this year (which I personally feel isn’t as good as the original, but that’s for another review I’ve been putting off), so that indicates to me that Hasbro intends to continue to build the Inhumans team. Plus, you can’t have Black Bolt without Medusa, or Medusa without Black Bolt. Oh, just get them both! Black Bolt is currently up for preorder on Amazon with a January 1, 2018 ship date. I’ve also added Black Bolt to the Marvel Legends Archive.